Just Romantic Suspense: What’s the fascination with Amish Suspense? What’s the fascination with Amish Suspense? For years, I had tried to break into the Harlequin series lines that featured romantic suspense. I came close a few times, but I didn’t hear the words, “They’d like to offer you a contract,” until I wrote a novel set in Amish country. Almost a year earlier, I had been at the Romance Writers of America conference in NYC. I went to a Harlequin workshop and an editor announced that she’d like to see more Amish suspense. Hmm? Amish? My wheels started turning. I remembered the first time I had ever seen an Amish man with his horse and buggy when I was a little kid. They were trotting along on the berm of a major road while we zipped by, eight passengers packed into my father’s Cadillac (pre-seat era). I was fascinated by the scene. I couldn’t image life without Happy Days and Laverne and Shirley, my favorite TV shows at the time. No electricity. Really? A little part of me thought my dad—who had the greatest sense of humor—was pulling my leg. The Harlequin editor’s request stuck with me. Before I flew home from NYC, I had an idea. What if a plane crashed on an Amish farm? I loved the idea of two worlds colliding. I arrived home, ordered some Amish books, both fiction and nonfiction and I continued my research by traveling to a growing Amish community south of my home near Buffalo, NY. (Again, who knew?) The plane crash idea eventually morphed into Plain Pursuit and was released by Harlequin Love Inspired Suspense in 2013. What is it about the Amish that fascinates us? Remember the 1985 movie Witness? No one will disagree that Harrison Ford looks hot in a broad-brimmed hat while undercover on an Amish farm to protect Kelly McGillis who looks rather fetching in her bonnet. Or what about Jodi Picoult’s bestselling novel, Plain Truth? This was eventually made into a Lifetime Movie. What about all the Amish “reality” shows? In 2014, the Amish are hot, hot, hot. And Amish fiction is no exception.  The Amish way of life is a throwback to a quieter time. Yet, they live among us. How do the Amish live without modern conveniences? Could you live without your iPad, car, AC, or TV? (However, the Amish are clever at making adaptations to meet their needs.) In some ways, do we envy the quiet way of life without the constant ping of smart phones? Or maybe this is just a romanticized notion. Farm life can be hard.  The setting itself is another character. In my Amish stories, I’ve had to find ways around not having say, a car or a cell phone. Actually, this comes in handy when I want the heroine to be in jeopardy. She can’t always call 9-1-1 or get away in her car. One of these days, I’ll have to work in an escape on a horse drawn buggy.  Two worlds collide. In my stories, I usually have the hero and heroine come from different backgrounds. One is (or was) Amish and the other is “English.” This immediately creates conflict not only in their budding relationship but also in how they look at life and the world around them. And how in the world will the Amish woman and the worldly man ever get their happily ever after?  The Amish setting also provides a unique twist on suspenseful scenes. Think horse and buggy, barn, cornfield, kerosene lamps, and homes without locks. The possibilities are endless.  One final note: One Amish community may differ in subtle ways from other Amish communities. The rules are established within each group. I created a fictional town, Apple Creek, New York. This allows me freedom to create the fictional world I need to tell a good story. Have you ever read a book set in an Amish community? What do you think the appeal is? If you haven’t read one, why not? I’m giving away one electronic copy of my 2013 Harlequin Love Inspired book, Plain Pursuit (Amazon or Barnes and Noble/US Only) to one person who comments. 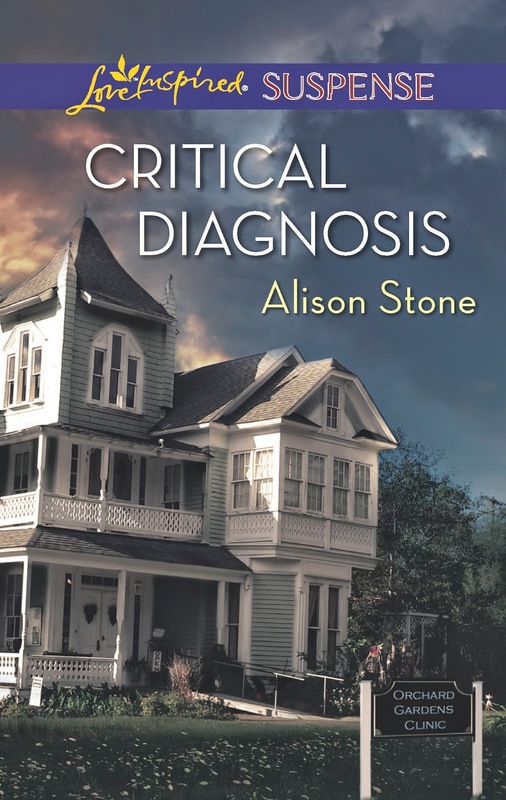 My latest romantic suspense from Harlequin LIS, Critical Diagnosis, is out in July. My latest book is not set in Amish country, but I do return to Apple Creek, NY in Plain Peril out in February 2015. Alison Stone left Buffalo, New York and headed a thousand miles south to earn an industrial engineering degree at Georgia Tech in Hotlanta. Go Yellow Jackets! She loved the South, but true love brought her back North. Alison lives in Western New York with her husband of twenty years and their four children where the summers are absolutely gorgeous and the winters are perfect for curling up with a good book—or writing one. Alison can be found on Facebook at https://www.facebook.com/AlisonStoneAuthor. Her website is www.AlisonStone.com. Her twitter handle is @Alison_Stone. Researcher Dr. Lily McAllister has dedicated her life to finding a cure for a family disease and now, steps away from a promising new treatment, Lily is attacked. Only the training of army physician James O'Reilly can save her. As the would-be CEO of his family's pharmaceutical company, James's secret dream is to reenlist. But he can't leave Lily with a bull's-eye on her back. Nor can he stay and stop her from pursuing her goal. No one can, including the stalker who shadows her every move. Still, James has lost too many people he's loved—and this time he refuses to lose Lily. 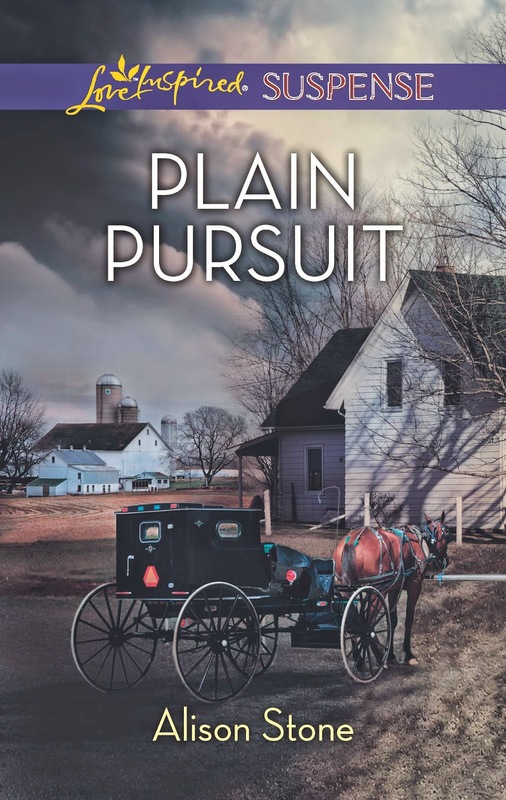 Alison will be giving away a copy of Plain Pursuit to one lucky person leaving a comment or email entry. Giveaway ends 11:59pm EST July 1st. Please supply your email in the post. You may use spaces or full text for security. (ex. jsmith at gmail dot com) If you do not wish to supply your email, or have trouble posting, please email maureen@justromanticsuspense.com with a subject title of JRS GIVEAWAY to be entered in the current giveaway. I have a few romances set in the Amish Community waiting for me in my TBR pile... I remember trips to my grandparents'... sometimes we would take side trips to Pennsylvania... there was this place that the Amish would sell their goods... I still remember how the deli ham would melt in your mouth and I miss the birch beer they would sell... thank you for sharing with us today! I enjoy the Love Inspired line! Having too many books is a very good thing. :) Thanks for stopping by. There is such a fascination with the Amish way of life. Adding in some suspense just heightens the reading pleasure. My favorite stories -- Amish or not-- are suspense. Thanks for taking the time to comment. I also haven't read any Amish romance. Just simply haven't come across any that have caught my attention. But I definitely hope to change that since your book sounds awesome :) thanks for sharing! I have read some Amish stories. I live in Ohio and have visited "Amish country" a few times. It's always so interesting to learn about a culture so close but yet worlds away from my own! Brooke, that's one of the things that fascinates me: the Amish live so close yet they live as if from another time. Thanks for stopping by. I haven;t read an Amish book yet, but i love the movie Witness with Harrison Ford. I go through phases when I read. I will be stuck on western romance for a while, then I will move on to young adult or all things time travel. Amish reads have been some of my favorite phases, in fact they inspired a trip to Amish Country in OH for our 5th wedding anniversary last year.